For more than a century, the Hudson River piers in Greenwich Village bustled with the maritime commerce that made New York the greatest port in the country. 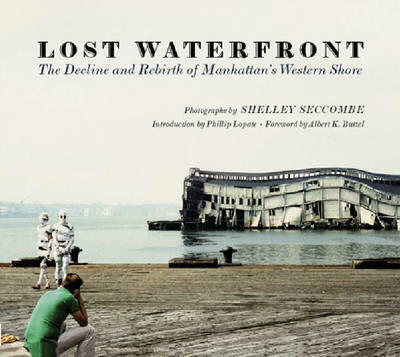 By the 1960s, after years of economic decline, the great waterfront was disappearing. After the West Side Highway was closed in 1973, many of the piers, now abandoned, burned, while others collapsed into the river. By the 1990s, only ghosts were left. Yet there came a moment in time-fifteen years, perhaps-when the decaying piers supported a thriving other life. These ravaged iron structures became the Jones Beach of Manhattan; rotting wooden decks were now stages for musicians, dancers, and acrobats; fishermen trawled for eel and old tires; and the collapsing docks soon created a unique cityscape. In this evocative book, photographer Shelley Seccombe documents 30 years of decay, transformation, and rebirth along the waters of Manhattan's west side Here are all 68 full color photographs in a unique record of a waterfront long since past-and a vibrant celebration of new city gem, Hudson River Park, opened in 2003. Where once tugs and freighters nosed into gritty docks, today there are green spaces where people come to lie in the sun, listen to water, paddle kayaks, and wonder at the passing vessels. These unforgettable photographs capture a city in change, and the pioneering creation of a new urban space that once again gives the river back to New Yorkers.